Okay, I always swore I wouldn’t post potty stuff on the internet, but I really do want to write this all down so I don’t forget how it all went. Feel free to click away if you’re not that interested in potty talk (Although, I promise I won’t be posting actual potty or poop pictures!!!). We’ve been potty training for the last few days, for realz this time. I decided that our last delivery of diapers from Amazon was IT and canceled the next shipment. I bought a couple packs of pull-ups for the transition, and lots and lots of cute “unnerwear” as Isaac calls them :). As soon as he was completely over the stomach virus, he was, completely on his own, suggesting that he go potty during the day and telling me when he dirtied his diaper (and bringing me a clean one). He’s been pee’ing successfully on the potty for months now, but just in the last couple of days he’s initiated the potty use on his own. The last few days, when Isaac wakes up I remove his diaper and he just goes “freestyle”. He never wants to sit on the potty first thing, because he wants to nurse, but I always suggest it anyway. I’m a little scared of getting pee’d on, but so far so good ;). As soon as he’s done nursing, he hops off my lap and runs to the bathroom to sit on his “froggy potty”. And pretty much every 30 minutes to an hour all day long after that, I’m reminding him to go. While I was at my massage appointment on Friday (and Daddy was home), Isaac apparently went in the bathroom with the light off, closed the door and pooped all by himself! He had gone #2 on the potty once before that, but that was after 20 minutes of sitting on the potty reading books and watching TuTiTu videos on Youtube during a window of time I knew he normally went. 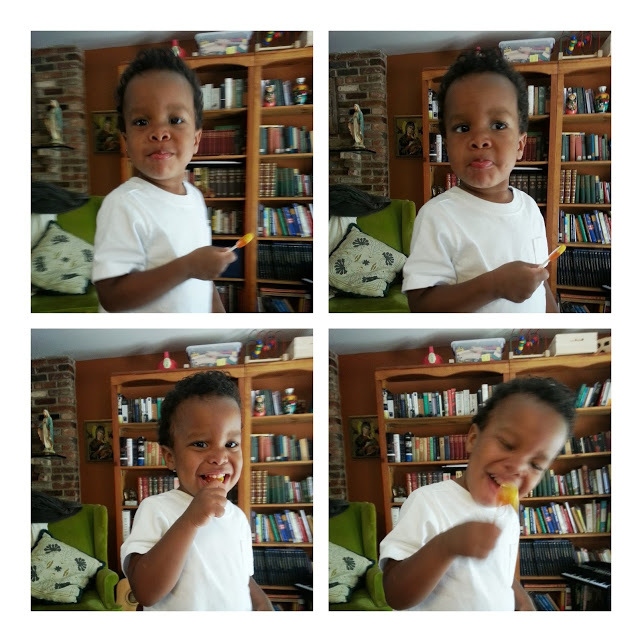 He was pretty impressed with himself, and was rewarded with a special lollipop :). When I came home from my appointment though, he was just BURSTING to tell me all about how he went and did a “BIIIIIG poop all by hisself!! !”, haha. It was the cutest thing ever. Yesterday, he stayed dry all day – even through his nap! Today, he took a 3 hour nap because he was up at 4:45 (ugh), so he did wet his diaper then, but he was completely dry while he was awake. We went to his gym class this morning and he had to potty half way through. We went out to the mall for dinner, some shopping, and a train ride and he pottied twice while we were out. When I was praising him afterward, he told me that “[You] don’t pee pee in pullup, Mommy!”. Like, duh, Mom, I GOT this. He drinks a LOT of water during the day, so he pees a LOT. Which is good, I guess. He’s getting to know the sensation and realize that hey, I better get to the potty! The first day that he just kinda “got it”, he kept grabbing himself and saying “peepee hurts!” (yes, he uses the same word for his boy bits and the act of pee’ing…not my idea, but his Daddy’s). Every time, I’d grab him and run to the potty and get all excited, telling him that “peepee was coming!”. He loves the excitement, just eats it up, so that worked for him. The times he was reluctant to stop playing and sit on the potty (when he’s got a friend over, for example), I set a kitchen timer (that I expressly got for this purpose) and as soon as the timer went off loudly, would tell him “It’s potty time, yay!!! !” and he’d get all excited and run to the potty. I can’t believe how well he’s been doing. I’ve got two or three pullups stashed in my purse, the car, the house, but that’s it. From here on out, it’s “unnerwear”! I just can’t believe how big my little guy is. Actually, we might just skip underwear for right now and just do shorts over bare bum. I don’t know if the briefs are just too clingy, or he’s not used to them yet, but it seems to be easier for him to just be bare. At home, he’s just completely bare, and I guess we’ll have to see what works best for out and about. I think we’ll be staying pretty close to home for the next few days though, to make sure we’ve got a good potty routine. Thursday morning, Isaac and I went to the beach for a couple hours and as we were driving out of the state park, he tells me “Need potty!”. Of course I forgot to have him potty after our showers and before we got in the car, so I pulled over and he did a little roadside pee’ing and we were on our way. I was so impressed. I’m sure there will be many accidents in his future. I’m sure we’ll be in nighttime diapers for ever and ever (which I’m totally okay with, by the way!). I wasn’t even sure I wanted to potty train already! I didn’t want to push him into it, and was feeling kind of wishy washy about the whole thing myself. Geez, everyone kept telling me that boys potty trained later than girls, so when he seemed ready and was practically begging to be rid of his diapers, I was completely surprised. But, hey, as Isaac would say, we’re “doin’ it”. 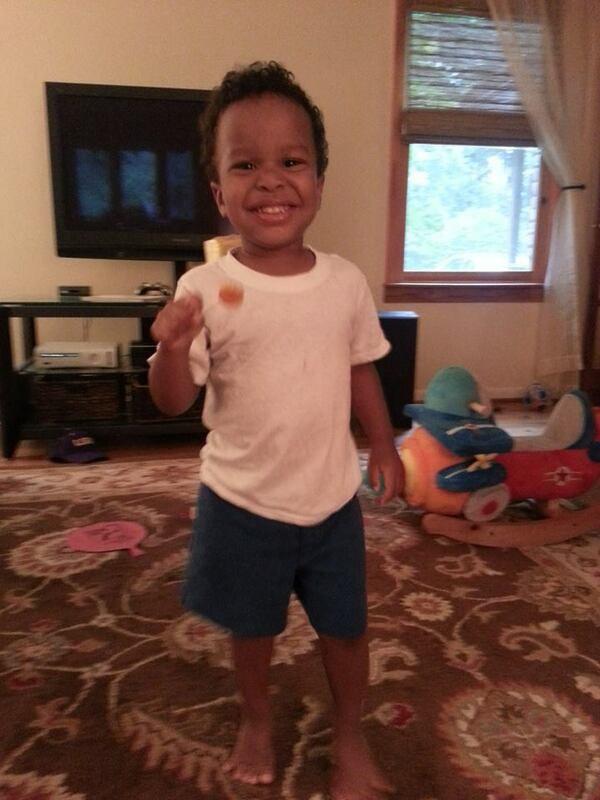 July 21, 2013 in being a mom, Isaac, potty training.